Next year, Lionsgate will transport viewers to a mythological world in the epic adventure Gods of Egypt. Earlier today, five new character posters debuted, courtesy of Yahoo! Movies, IMDB, Hitfix, Entertainment Weekly and the movie's official Twitter page, which introduces us to the five main characters. 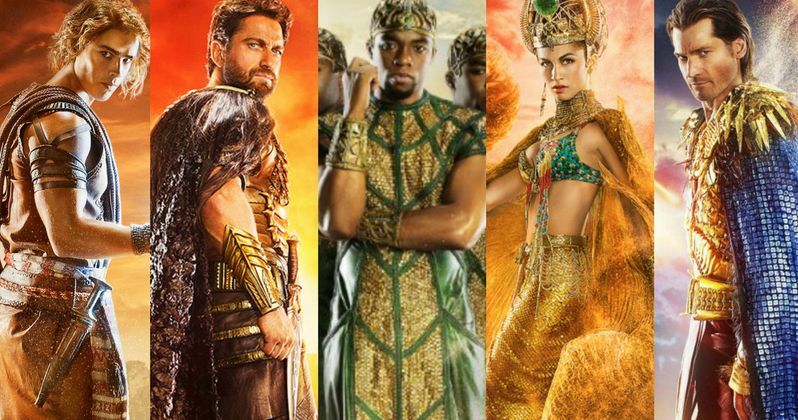 These posters feature Gerard Butler as Set, God of the Desert, Nikolaj Coster-Waldau as Horus, God of the Sky, Brenton Thwaites as Bek, Thief of Legend, Chadwick Boseman as Toth, God of Wisdom and Elodie Yung as Hathor, Goddess of Love. Magic, monsters, gods and madness reign throughout the palaces and pyramids of the Nile River Valley in this action-adventure inspired by the classic mythology of Egypt. With the survival of mankind hanging in the balance, an unexpected hero takes a thrilling journey to save the world and rescue his true love. Set (Gerard Butler), the merciless god of darkness, has usurped Egypt's throne, plunging the once peaceful and prosperous empire into chaos and conflict. With only a handful of heroic rebels opposing Set's savage rule, Bek (Brenton Thwaites), a bold and defiant mortal, enlists the aid of powerful god Horus (Nikolaj Coster-Waldau) in an unlikely alliance against the evil overlord. As their breathtaking battle against Set and his henchmen take them into the afterlife and across the heavens, both god and mortal must pass tests of courage and sacrifice if they hope to prevail in the spectacular final confrontation. The supporting cast includes Geoffrey Rush as Ra, Rufus Sewell as Urshu, Courtney Eaton as Zaya, Abbey Lee as Anat and Goran D. Kleut as Anubis. With the arrival of these posters, the first trailer may be just around the corner, so make sure to keep your eyes peeled for the new footage in the near future. Gods of Egypt is set to hit theaters on February 26, 2016, going up against Paramount's The Brothers Grimsby, Relativity Media's Kidnap and A24 Films' The Witch. Another epic adventure, MGM's Ben-Hur, was originally set to arrive on this date, but it was recently moved to August 12, 2016. While we won't know for sure until late February, Gods of Egypt could be one of next year's early box office hits. Alex Proyas (I, Robot) directs from a script by Burk Sharpless and Matt Sazama (The Last Witch Hunter, Dracula Untold). Take a look at these new character posters, and stay tuned for the first trailer, which could be arriving any day now. Are you looking forward to this mythological Egyptian adventure? Let us know what you think, and stay tuned for more on Gods of Egypt.